The Honor View 20 has finally launched in India today. The phone is featuring a 48MP camera at the back and has a punch hole cut on the front for a selfie camera. We are comparing it with the Samsung Galaxy A9 to see which device is more powerful in terms of specifications. The Honor View 20 is the world’s first smartphone that has a 48MP sensor on the back. It is also the first device by the Chinese company, which has a punch hole cut out at the front for a selfie camera. The device is priced at Rs 37,999 in India and will go on sale tomorrow via Amazon. On the other hand, we have the Samsung Galaxy A9, which is the world’s first device with a quad camera setup on the back. The phone is launched in India last year at a price of Rs 33,990. So, let’s compare these two devices on paper to see which one would be the right buy for you in terms of hardware. 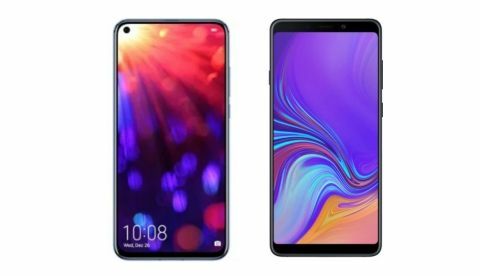 Let’s start with the display, the Honor View 20 sports a 6.39-inch screen that offers a resolution 1080 x 2310 pixels, while the Samsung Galaxy A9 has a slightly smaller 6.3-inch display that comes with a resolution of 1080 x 2280 pixels. When it comes to the processor, the Honor View 20 is powered by a Kirin 980 octa-core processor, which is paired with 6GB RAM and 128GB internal memory, which cannot be expanded. On the other hand, the Samsung Galaxy A9 is powered by a Qualcomm Snapdragon 660 processor, which is coupled with 6GB RAM and 128GB internal memory. The storage is expandable to up to 512GB via a microSD card. Coming to the cameras, the Honor View 20 sports a dual 48MP + TOF 3D camera at the back along with a 25MP sensor on the front. One of the main highlights of the Samsung Galaxy A9 is its rear cameras. It is the world’s first device that has a quad 24MP + 10MP + 8MP + 5MP camera set up at the back along with a 24MP unit on the front. However, having four cameras doesn’t make the Samsung Galaxy A9 cameras better than the View 20 as there are a lot of aspects, which you need to take a look at before coming to any conclusion. 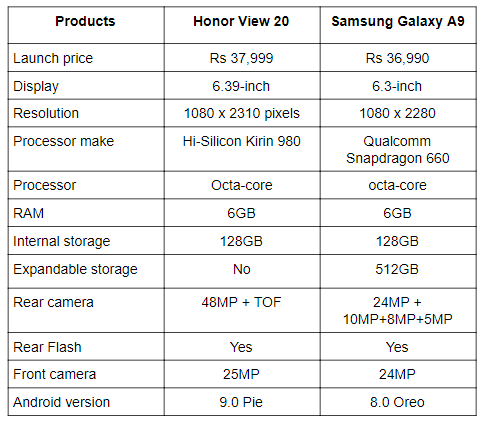 The Honor View 20 will go on sale on January 30 via Amazon, while the Samsung Galaxy A9 is available on Amazon for Rs 33,990.